I love a baseball tee. I have been wanting to figure out how to make my own for awhile now. There are A LOT of perks to using pre-made tees for this sewing project, especially if you are like me and don't have a serger (aka knit fabrics best friend). In this tutorial I will provide a pattern for a 2T size, but that pattern can be manipulated to fit the size you need. Or you can feel free to make your own pattern using an existing baseball tee you have laying around (this is what I did to make my pattern). Every once in awhile in an insecure anxiety ridden moment I decide to disclaim that I am no where near a skilled seamstress. I am very much a figure-it-out-go-by-the-seat-of-my-pants kind of sewer. I share the how-to that works for me, fully knowing that some of you out there might see it and go..."umm...I think there is an easier way to do it." I often use shortcuts to make my sewing projects easier or simply because I am missing some of the tools that would be necessary for a step (afore mentioned serger). Sometimes I might fuddle my way through the explanations in my non seamstress lingo, but I am always happy to explain myself if there are any questions. I enjoy creating and it has been a journey to get brave enough to share it with all of you my bloggin' peeps. Okay, so that is my sewing tutorial disclaimer, you guys still love me, right? Whew. Novel done. I should be good on the disclaimer for quite awhile now. If you make your own pattern, you will need to cut off the sleeves, the front, and the back of the shirt. Trace each piece and cut out. If using the print out patterns, cut each pattern piece out. Attach pattern pieces together as indicated. Cut the front and back pattern from the white tee, you will need 2 2x12 inch strips for the sleeves, so make sure you account for that when you lay out your patterns. Line up the pattern of your sleeve with the bottom of the pre-made tee. This way the hem of your sleeve is already finished. You will cut out one sleeve from the front of the shirt and one sleeve from the back. Cut off the existing neck band from the sleeve color tee. Cut it off just below the exiting seam, cutting just a bit of the tee shirt off with it. Set this aside to sew onto finished tee at the end. I measured my length according to the neck piece from my existing baseball tee, however, I recommend not cutting it until your tee is sewn together and you see how much you need. Cut 2 2x12 inch strips from the leftovers of the white tee shirt. Iron them in half and then sew up one side of each strip. Line up your strips with the seam facing the right side of each sleeve. Pin in place 3-4 inches from the bottom. Sew in place with coordinating thread. Stitch along both edges. Repeat on other sleeve. There is a back and a front side of each sleeve. Make sure you pin, with right sides facing, the back of the sleeve with the back panel of your tee or the front of the sleeve with the front panel. It doesn't matter if you do front or back first as long as they match up correctly. I am going to start with the front here. Pin right sides facing. Sew with 1/4 in seam allowance. I tried both a zig zag stitch and a regular, for me there was no difference. I know many people find using a zig zag stitch better on knits (again when there is no serger). I leaned slightly towards the regular stitch. For a nice finishing touch I sewed stitches on the tee along either side of the outside seam line. Repeat on the process with the back of the sleeves and the back tee panel. Once the sleeves are attached, match up the sleeves and the side seams. Pin in place. Sew with a 1/4" seam allowance all the way up from the bottom, under the armpit and along the bottom of the sleeve.Repeat on other side. Turn your almost finished shirt right side out. Grab your neck band reserved from the pre-made tee. Measure how much you need. Cut the band and then sew together to make a circle. There is a right side to the band. Lay the band with the right side facing the right side of your tee. This will take a little stretching and manipulating the band. Patience is your friend. Make sure the place where you attached the band to itself is in the back. Sew with about a 1/4" seam allowance. Basically you will want to sew as close as possible to where the original neck band met the original tee. Turn band up, pushing the raw edge inside the tee. Iron. Almost done with construction. Whew. Turn shirt inside out. Fold up 1/2" and iron. Then fold it up another 1/2" and iron. Make sure to carefully fold to ensure you still have the curve at the bottom of your shirt. Turn the tee back right side out. Sew along the bottom of the tee following your ironed hem. Stitch again 1/4' below what you just stitched, creating a double row of stitches. If the baseball tee is all you care about, YOU ARE DONE. BUT, if you would like to know what I did to get the graphic on my tee, keep reading. I found a silhouette of a dog shape I wanted and I actually cut it out with my Silhouette on some scrap vinyl. HOWEVER, I have also done the same stenciling process with freezer paper. Here is a tutorial where I used freezer paper. Once you have your stencil, apply it where you would like it on your shirt. Make sure you have put a piece of cardboard, or even a cereal box front, in between the layers of your shirt. Apply the paint, evenly and carefully at the edges. Reapply more coats for a more even coverage. Let the paint dry, remove stencil. Pictures seem to be missing for the rest of the steps but I think a simple typed out step by step will still work. 1. Using a font you like as a template, cut out the letter for kennel from the scrap of sleeve tee fabric. Without poking your eyes out (yes it is a labor of love) sew on each letter individually. 2. Cut out another stencil (either vinyl or freezer paper) in a different font with the word club. Place that stencil below and slightly over the word you sewed on. Repeat same painting process used with the puppy stencil. OKAY NOW you are done! You have a great tee shirt that your little man will love. You will love. Everyone else will love it AND they will be amazed you made it. My Little Man has already worn it 3 times, he calls it his "ruff, ruff" shirt. So cute. Seriously adorable!!! 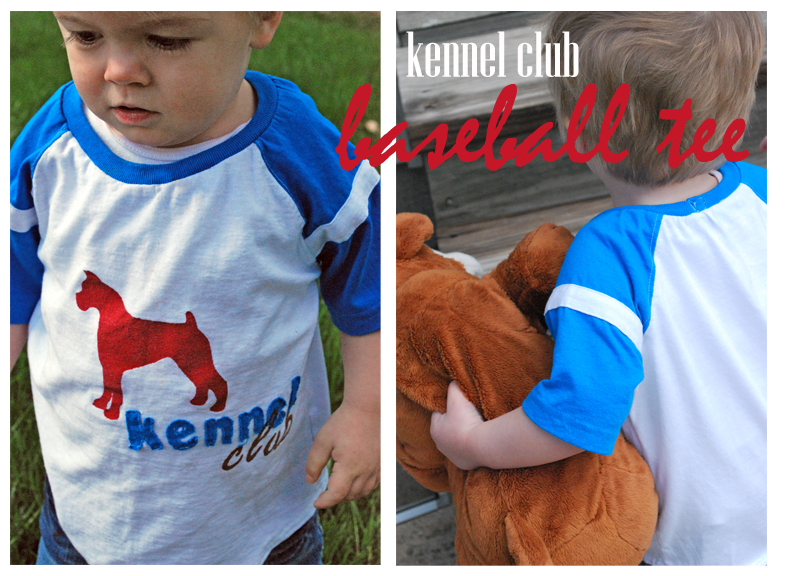 I love baseball tees on kids! I can't wait to make one! How cute! :) I agree that for the sides and the raglan seams, you don't really need a stretchy stitch, since the fabic won't be stretched in that direction. But if you want to be able to stretch the neck opening and avoid having the seam break, you need to use zig-zag, a stretchy seam (like --v--v-- or _/_/_/_ ). You can just stretch it while sweing a straight stitch, but it might cause the fabric to get stretched and bubbly. For really nice strechy hems, get yourself a twin needle which is super easy to use and make that nice double stitch that looks like straight stitches from the front and zig-zag from the back. So no need for a serger.